Naturalized in California. Present in 10 counties according to Calflora. Native of Caribbean, Central and South America, but naturalized in neotropical and subtropical regions of the world. There are many points in GBIF. Naturalized in California. Present in 10 counties according to Calflora. Native of Caribbean, Central and South America, but naturalized in neotropical and subtropical regions of the world. There are many points in GBIF, including areas of South Africa, Australia, China and Europe that are similar to California. L. camara is generally deleterious to biodiversity and human activities and has been the target of control programs for a century; however, successful control has only been achieved in a few instances using biocontrol agents. In Australia, India and South Africa aggressive measures to eradicate L. camara over the last two centuries have been largely unsuccessful, and the invasion trajectory has continued upwards despite control measures (CABI Invasive Species Compendium). L. camara is considered invasive in Florida, Hawaii, New Caledonia, Australia and New Zealand. Note from Ron Vanderhoff: it should be noted that in California I cannot find any specific evidence of documented invasive behavior for this species. I carefully reviewed all 40 Calflora records (which includes all georeferenced CCH records). I read the individual location descriptions and the comments for each record and viewed an aerial map (where the location accuracy is high). In summary, there is no record that appears to indicate invasiveness. The majority of the records reference individual plants, mention roadsides or disturbed areas or mention landscaping. This does not discount any of the scores contained in this review and does not discount invasiveness in other areas of the world. In conclusion, it does not appear that this species is (yet) exhibiting invasiveness in California. L. camara is generally deleterious to biodiversity and human activities and has been the target of control programs for a century; however, successful control has only been achieved in a few instances using biocontrol agents. In Australia, India and South Africa aggressive measures to eradicate L. camara over the last two centuries have been largely unsuccessful, and the invasion trajectory has continued upwards despite control measures (CABI Invasive Species Compendium). There are many points in GBIF, including areas of South Africa, Australia, China and Europe that are similar to California. 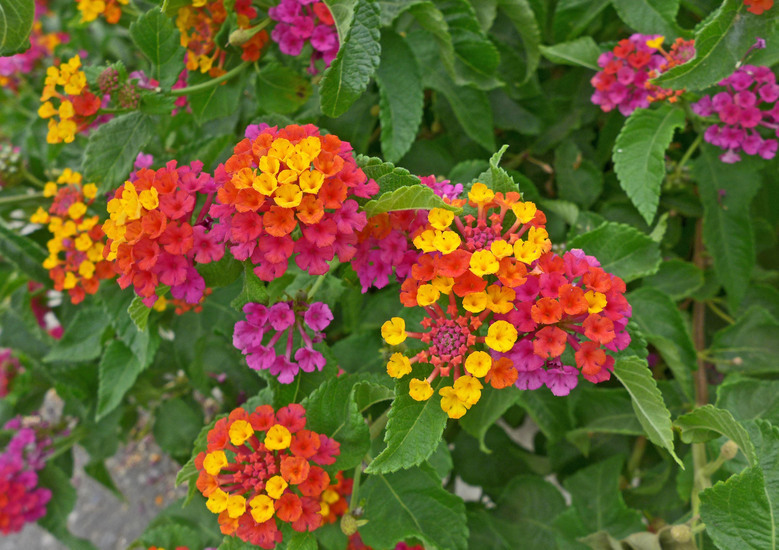 Lantana montevidensis is also naturalized in California and occurs in a few of the climate areas which match California: Southern Europe, Australia and New Zealand. It is also considered invasive in Florida, Hawaii, New Caledonia, Australia and New Zealand. In natural and semi-natural vegetation L. camara may smother vegetation and increase fire intensity (due to an increase in dry biomass), thus displacing native scrub communities. The alkaloid-rich leaves of L. camara are virtually immune to grazing by livestock, so in areas where it dominates the vegetation it could alter grazing regimes. When ingested by cattle and sheep it may cause photosensitive reactions, diarrhoea, jaundice, hepatitis and poisoning. Children have been known to die after eating unripe berries. Vardien, W.., Richardson D.. M., Foxcroft L.. C., Thompson G.. D., Wilson J.. R. U., & Le Roux J.. J. (2012). Invasion dynamics of Lantana camara L. (sensu lato) in South Africa. South African Journal of Botany. 81, 81–94. Stands of L. camara, and of the prickly variety in particular, hinder human access to invaded habitats. It forms extensive, dense and impenetrable thickets in forestry plantations, orchards, pasture land, waste land and in natural areas. Existing colonies may also spread laterally via the production of suckers or when branches take root after coming into contact with the soil (i.e. by layering). Stem fragments or pieces of the rootstock (i.e. crown) can also give rise to new plants after being moved by machinery or dumped in garden waste. Heavy fruit crops are produced yearly. Seeds germinate when sufficient moisture is available, usually at the start of a rainy season. A single plant can produce up to 12,000 seeds per year. Taylor, S., Kumar L., & Reid N. (2012). Impacts of climate change and land-use on the potential distribution of an invasive weed: a case study of Lantana camara in Australia. Weed Research. 52(5), 391–401. Seed dormancy was initially high, but dropped significantly in the first 6 months with steady declines thereafter. This suggests that dormancy of lantana seeds is largely exogenous, with primary dormancy breaking down quickly. Results indicated that under field conditions one would expect seedling emergence percentages to be low (25% or less) and that emergence from a single cohort may continue for 3 yr or longer under fairly typical field conditions. However, seedling emergence could be considerably greater where the soil remains moist for extended periods. Comment from Ron Vanderhoff: I see a few published references to poor seed germination for this species. A notable study (Wijayabandara et al 2013) suggests that the seed had almost zero germination without assistance from ingestion by birds. In the same study, cold stratification is suggested, but was not tested. Germination rates appear to be quite low in this species, suggesting that this PRE score may be too high. Vivian-Smith, G., & F. Panetta D. (2009). Lantana (Lantana camara) Seed Bank Dynamics: Seedling Emergence and Seed Survival. Invasive Plant Science and Management. 2(2), 141–150. Wijayabandara, S.M.K.H., Jayasuriya K.M.G.G.., & Jayasinghe J.L.D.H.C.. (2013). Seed Dormancy, Storage Behavior and Germination of an Exotic Invasive Species, Lantana camara L. (Verbenaceae). International Research Journal of Biological Sciences. 2, 7–14. Plants mature and produce seeds in one year and are long-lived and drought tolerant once established. Flowering and fruiting take place throughout the year with a peak during the first 2 months of the rainy season. Germination across the range of temperatures tested indicated that lantana germination can occur at any time of the year in a subtropical environment (Vivian-Smith 2009). A number of bird species, and also sheep and goats disperse the seeds, sometimes over long distances. Heleno, R. H., Olesen J. M., Nogales M., Vargas P., & Traveset A. (2013). Seed dispersal networks in the Galápagos and the consequences of alien plant invasions. Proc. R. Soc. B. 280(1750), 2012-2112. Occasionally abiotic seed dispersal may occur. Flash floods in South Africa, caused by cyclone Demoina in 1983, transported seeds and deposited them on the flood plain of the Ndumu game reserve. In Kruger National Park L. camara has spread primarily along rivers (Vardien 2012). Seeds are dispersed over long distances by birds and mammals, as well as through horticulture. Reviewed by Ron Vanderhoff, Naomi Fraga and Gina Darin. Comment from Ron Vanderhoff on L. camara invasiveness in California: it should be noted that in California I cannot find any specific evidence of documented invasive behavior for this species. I carefully reviewed all 40 Calflora records (which includes all georeferenced CCH records). I read the individual location descriptions and the comments for each record and viewed an aerial map (where the location accuracy is high). In summary, there is no record that appears to indicate invasiveness. The majority of the records reference individual plants, mention roadsides or disturbed areas or mention landscaping. This does not discount any of the scores contained in this review and does not discount invasiveness in other areas of the world. In conclusion, it does not appear that this species is (yet) exhibiting invasiveness in California.